I have been with the Club for over 26 years and have loved every minute of teaching and coaching kids at the Club. I have also been president, vice president and secretary of the club at the same time as coaching such was my passion for the Club. I have also been heavily involved with fundraising for the Club and also accompanied the kids on many trips away, even going to Malta. In 2013 I was nominated for West Lothian Volunteer Life Time Achievement Award, coming in as joint 1st. Sadly I couldn't attend the awards night due to ill health at the time but my daughter Debbie attended on my behalf. The only time I win something and couldn't make the event!!!!!!! I’ve been swimming with BASC since I was 6 years old and I’m still there swimming with the Masters, although the only competition I’ll be taking part in is the club champs! I’ve entered my fair share of galas including the Scottish Nationals. I used to be a big backstroke fan, but these days I quite enjoy the challenge of swimming butterfly! I have been a coach with Bathgate for over 5 years and I’m feeling more passionate than ever. I started swimming with Bathgate at the age of 11 and quickly moved through the squads to become part of the Swim West Lothian Performance Squad. I have competed at many senior competitions including Scottish Schools Finals and Scottish Nationals as well as being a District Finalist and West Lothian Champion. My favourite stroke is Breaststroke and I was consistently ranked in the top 5 in Scotland for my age group. I have twice competed internationally with the team representing Scotland in Germany where I won medals for a variety of events. I was selected to captain the team in 2011 when I was interviewed for a German Newspaper. I won the Club 400, three years in a row, and hold several club records. I was invited to help teaching with Bathgate when I stopped competitive swimming to focus on my studies in 2012. I now coach the Silver Squad and I returned to Swim West Lothian as part of their new National Potential squad in 2014. I work in IT at Sky in Livingston, love seeing swimmers achieve their goals, watching live music and eating Terry's Chocolate Oranges. I have been swimming since I was just a baby and have always loved it. I started swimming in countless galas when I was around 7 where backstroke was both my best and favourite stroke. I also won quite a few medals and other achievements with the club including the 8 and under club champs in 2006 and the 10yrs champs in 2008 - the photos of which are still on facebook! For a short period I also trained with Swim West Lothian then finished swimming at age 11 but now currently swim in the Bathgate masters. It was not until I had to volunteer somewhere as part of my bronze Duke of Edinburgh award that I got back in touch with the club (about 3 years later) and began my journey to passing my level one in August 2014. This year (2015) I am 17, in my last year at school and hoping to go to university somewhere in Scotland to study business management. In my free time I like to watch a lot of TV and go out with friends. I began swimming at the age of 5 and have been with BASC for a number of years now, firstly as a competitive swimmer then moving on to water helping with tadpoles. I then started to shadow coaches around poolside until I achieved my Level 1 teaching in September 2013. Coaching is great fun and I enjoy passing my experience and knowledge onto the younger generation. At present I am studying Psychology at the University of Edinburgh. I learned to swim from the age of 5. 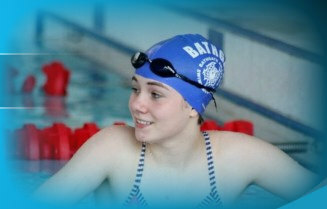 I joined Bathgate Swimming Club when I was 11 back in 2008. I swam competitively for 5 years representing BASC and Swim West Lothian. I had always aspired to be a coach so I began water helping at the start of 2012, progressing on to shadow coach around poolside and complete my level 1 teaching in the summer of 2013. My favourite stroke is Frontcrawl. I recently finished school at St. Kentigerns Academy and I now work at Standard Life. I joined Bathgate at age of 9 in Tank 1 and have now progressed to the Swim West Lothian Performance Squad. I train just over 20hours a week with a mix of land conditioning and pool work. My favourite stokes are Butterfly and Freestyle and I was a part of the Swim West Lothian team that came 8th in the 2014 Scottish Team Championships. I represented Scotland in Germany in 2011, have now won the club 400 two years in a row and have my eye on a number of longstanding club records. As a member of the Swim West Lothian Performance squad, all swimmers are encouraged to return to assist their own club once a month and this has led to me being appointed as coach for the Masters and Adult Improvers on a Friday night as well as writing sets for their other sessions. I am currently in 5th year at Bathgate Academy where I really enjoy Maths and Computing. I do not have much spare time, but enjoy games on my x-box, watching tv and playing with my dogs. I swam for about 9 years when I was younger for Trojan, I also swam with the West Lothian Squad for about 4 years of this time. I represented West Lothian in a number of competitions including a few international galas. I won a number of East District golds including holding the 4x50m IM relay for a two consecutive years. I also had a brief stint with Heriot Watt University, however I suffered a serious injury so had to stop. I joined Bathgate following an operation on my injury in 2013 as a masters swimmer. After about 9 months with the club, I was asked to help out by taking the land training for Masters on a Friday night. I then went on to take the Level 1 Teachers course and now take the Silver Squad for land training along with the Masters squad. My ambition for the squad is to help the kids progress in swimming by giving them an idea of what areas to work on to help their strokes in a fun and challenging way. In my spare time away from swimming I work as a Structural Engineer designing bridges and am currently training with a few Masters swimmers for Tough Mudder in June. Swimming has always been a recreational sport I have enjoyed and loved to do - even when I was a baby! I joined BASC when I had just started high school and thoroughly enjoyed progressing and excelling in the strokes, while swimming in a social and competitive atmosphere. After progressing up to Gold squad, I had to leave the training aspect of swimming to concentrate on my studies. However I remained as a part of the club and undertook the role as one of the water-helpers which had always been a passion of mine, and one that I wanted to take further, alongside my studies at University. At the beginning of 2015, I was pleased to became level 1 qualified and I look forward to teaching and coaching children of all abilities in the club! Our coaches and teachers come from various backgrounds and are all qualified to Teacher Level 1 or Above.